It has been difficult for me to post the past few days because I'm spending some time on the Washington coast. Wind, rain, and very brief moments of sunshine have sprinkled my days. Because of the weather, I've been able to grab a number of spare moments to paint. My subjects have been of sunshine and warmth, waiting for spring to arrive. 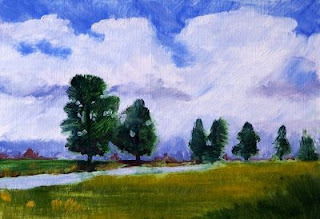 This painting is 9x12 inches on a hand-stretched gallery-wrapped canvas. I used a heavily textured canvas and began this painting of the Nisqually Flats with a red wash. Most of the time I paint on gessoed hardboard panels, so painting on this little canvas was a nice change. Since I'm travelling and since canvas can be tricky to transport, this was the only canvas I brought along. Now I am anxious to do more paintings on some more of this heavy canvas. I'm not sure the weight--it was left over from another project--but it is heavy with a knobby texture that made a great surface for painting the grass of this landscape. 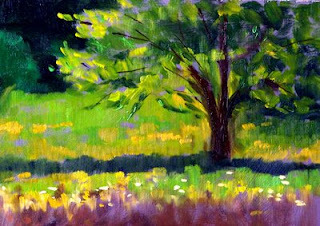 While I'm thinking of summer, another tree has emerged from my paint brush. 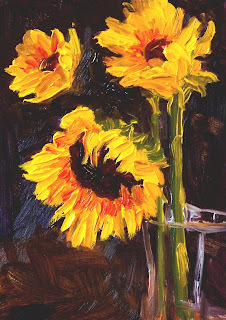 This little 5x7 inch oil painting makes me excited for warm weather and summer blooms. I've listed it in my Etsy Gallery for a price of $50.00 plus $6.50 for shipping to US addresses. Purchase information for this painting is available here. 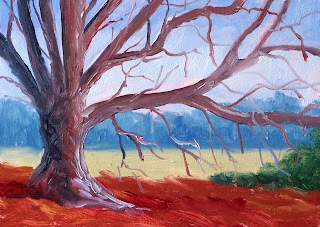 Other small format tree paintings are available in the Tree section of my Etsy Gallery. Yesterday evening after I got home from my walk in the park and finished my little painting of the old Walnut tree, I started looking through some photos I took last summer. Now I'm longing, really longing for those long summer evenings. 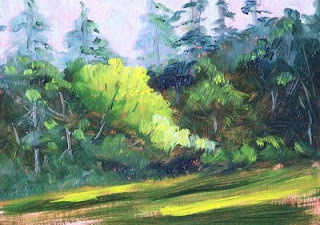 All the lush green inspired me to create a little summer evening painting. It was a good challenge. Greens are always tricky, but I was happy with the results of the limited palette on this one. I started with an underpainting of Terra Rosa. After that, my palette wsas limited to Utramarine Blue, Sap Green, Cadmium Lemon Yellow, and Titanium White. This painting is 5x7 inches on a gessoed hardboard panel. Yesterday the sun came out just long enough for me to get out of the house and take a walk at one of my favorite parks. It was cold and crisp with a winter-like breeze. The only hint of spring was some faint sunlight. When I passed this old walnut tree, I couldn't help but marvel at how old it must be. Its branches are huge, scraggly, and bare. The trunk with its heavy bark, knarled with age, especially caught my attention. I snapped a picture and when I got home painted it. Since it is a tree I visit often, it will probably be a subject for painting again when it begins to leaf out. This painting is 5x7 inches on a gessoed hardboard panel. This is the second in my series on this Irish linen table cloth. A pile of fresh peaches provides a bright contrast to the dark background and the light of the cloth. This painting is 8x10 inches. I will be experimenting with fruit in this format while I look for subjects to use on some 24x30 inch canvases that are sitting in my basement. I'll probably experiment a little more before selecting subjects for the larger canvases. 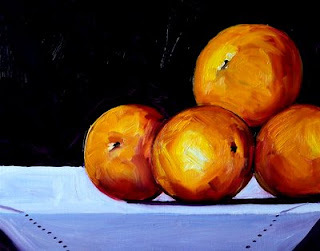 I'm also trying to fill out the offerings of still life paintings in my Impressions Gallery at 1000 Markets, so some of these little paintings might arrive there, too. This painting is SOLD. 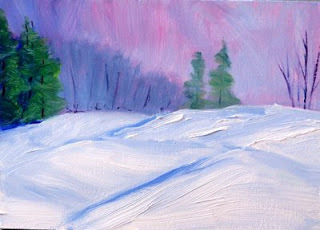 A winter sunset--cold and brilliant--that is what inspired this 5x7 inch oil painting. The warmth of the evening sky contrasting with the cool of the ground provides a bright spot in an otherwise dreary winter. This little oil painting is for sale in my Etsy Gallery for $50.00 plus $6.50 for shipping to US addresses. Click here for more detail, purchase information, and closeups of the brushwork. Happy St. Patrick's Day! I hope you had a wonderful day and will have a wonderful evening. 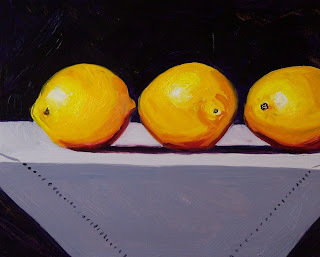 This 8x10 inch oil painting of three lemons on an Irish linen table cloth is about as close as I can get to a holiday themed painting. My Irish ancestors would have approved. When the paint dries, I will ponder several choices. Should I sell it in my Small Impressions Gallery at Etsy, my Impressions Gallery at 1000 Markets, or create a larger version using this as a reference? With the cool damp weather in the Pacific Northwest, it may take weeks to dry, giving me plenty of time to make a decision. Today's painting was so fun to paint. 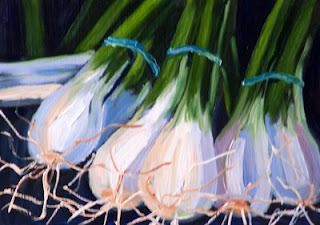 I began on a black gessoed surface, mixed up a range of grays and painted the bulbs of the onions. Next I added the greens with a mixture of sap green and cadmium lemon yellow. After adding the rubber bands, I painted the crooked little roots with my rigger brush. It was quick and fun. 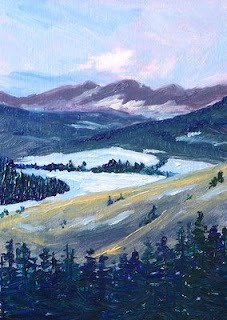 I'm considering taking this little 5x7 oil painting and upscalinging to something larger for placement at my Impressions Gallery in the Artists Collective Market at 1000 Markets. I added a new 11x14 inch still life painting yesterday and am anxious to add more. This morning I awoke to an unexpected shower of snow. Winter seems to want to hang on longer than usual this year. With the wet and cold outside, I spent my morning in my studio painting. 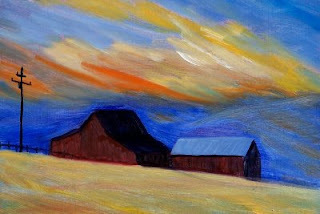 For this little 5x7 inch oil painting I began with an undercoat of alizarin crimson which gives a warm tint to the winter sky. Hopefully this will be the last of the white stuff and perhaps my last winter painting for the season. I have placed this painting for sale in my Etsy Gallery. 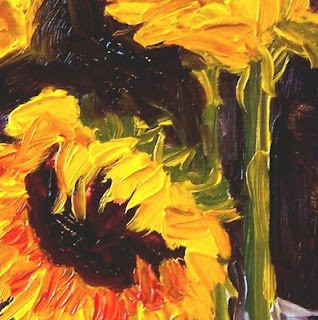 Closeups of the heavy brush strokes are available by clicking here. The purchase price is $50.00 plus $6.50 for shipping to US addresses. Today's painting is my effort for the Different Strokes Bi-weekly Challenge. 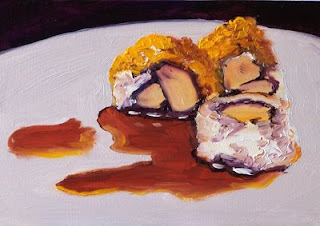 It is a 5x7 inch oil painting of a plate of sushi. I am not a sushi eater, so I'm not sure whether this is an appetizing rendetion or not. I hope it is. It was fun to paint because of the texture and transparency of the soy sauce. 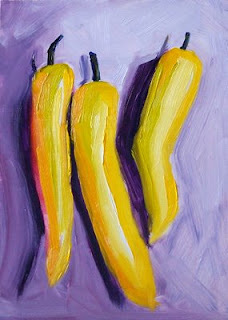 If you visit the Different Strokes Blog, you will see a number of interpretations of this same still life. Although I like to participate in the challenge, it has been a while since I've done so. It was fun to get back into the game. Last night I spent the evening watching a portrait demonstration by artist, David Darrow, also known as Dave The Painting Guy. I don't paint portraiture, so it was interesting to watch his technique. The trouble is I was so fascinated with watching his Ustream live feed video that I accomplished absolutely nothing else--didn't even do my daily blog update. Thus, I am compelled to make sure I update tonight. 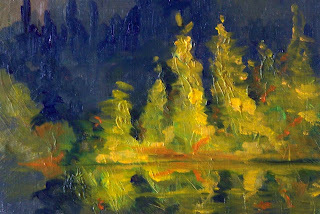 This little 5x7 abstract landscape oil painting is one I especially like. It has interesting textures and the contrast between dark and light is a pleasure to view. It is listed for sale in my Etsy Gallery along with several other reflection paintings. It can be purchased for $50.00 plus $6.50 for shipping to US addresses. Click here for closeups of the texture and more purchase detail. 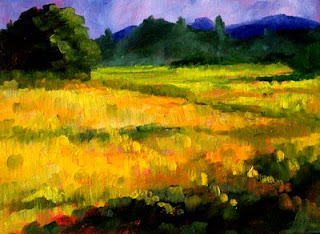 This 8x10 inch painting is the second in a pair of studies inspired by fields of daffodils. Daffodils are beginning to bloom in spite of recent flurries of snow. I love the warmth of these sunny yellow flowers that remind me spring is coming. 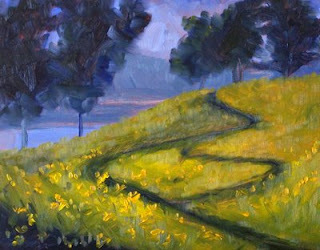 This particular painting is a hillside of naturalized blooms while the companion painting is a field of cultivated flowers. Both will eventually be for sale in the Impressions Gallery at 1000 Markets. It is March and it is snowing in the lowlands of the Pacific Northwest. It is crazy--it isn't supposed to be like this. Snow in February is a surprise here, but March is unheard of except in the mountains. 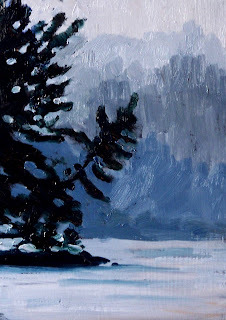 This 5x7 inch oil painting documents snow in the Cascade Mountains of Washington State where it is supposed to be. Skiers and snowboarders love it, but lowland dwellers are perplexed. This painting is for sale in my Etsy Gallery for $50.00 plus $6.50 shipping to US addresses. Click here for closeups and additional purchase information. Today was not a productive day. I think it was the change to daylight savings time that has thrown me off. I spent several hours in the studio this morning and couldn't produce anything worthwhile. Three wiped-off paintings later, I finally decided to prepare some panels instead. 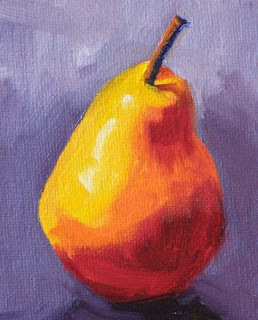 In addition to preparing panels, I am selling two little 4x5 inch paintings of pears in my Etsy Gallery. This is one of two I have listed. These little miniature oil paintings are created on 4x5 inch canvas panels. I like the colorful nature and visualize them brightening up a little corner of someone's kitchen. The other pear painting can be viewed here. In a few minutes I'm going back to my studio and dig around a little. I think there are several more in this little series that might look nice in a grouping. Looking forward to a good night's rest and a more productive day tomorrow. This is another one of my no-blend fruit paintings. I like the results of mixing my paint for the fuit in a four-color range, painting boldly, and not fussing. When I skip the blending, my paintings are finished more quickly and don't suffer from the mud of over working for some unnecessary detail. The colors remain pure and bright. When the paint is dry, this one will join some of my other fruit and vegetable paintings at my Etsy Gallery. It is 5x7 inches on gessoed hardboard panel. I'm celebrating tonight! I just received an e-mail informing me that this painting has been accepted into the juried section of the 40th National Fine Arts Show in Ocean Shores, Washington. The show takes place April 3, 4, and 5 of this year. The painting is 5x7 inches, oil on gessoed hardboard. It always feels like a shot in the dark when I send of my entries to art shows. A million questions enter my mind. Which paintings do I have that are available for showing? What size should I submit? Should I submit a landscape or a still life? Is this one a better choice than that one? Eventually I make a few choices, mail my entries, and try to forget about it. It is so nice to receive the news that someone appreciates my work enough to select it from amongst the many that I know have been submitted. So, tonight I celebrate! I love this little 5x7 inch oil painting! The blue sky and the line of trees brings the coming of summer to mind. It was a joy to paint. I've kept it in my private collection for a while, but my personal collection is becoming over populated. It is time for me to send this little favorite on to a new home. This painting is now available for purchase from my Etsy Gallery for $50.00 plus shipping. Closeups and purchase information are available here. Today's painting is so absolutely silly, that I had to share it. 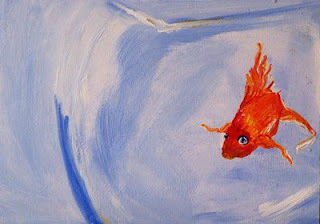 This 5x7 inch painting is the portrait of a goldfish given to my son by a friend. The fish came home in a plastic bag as pet fish do. He was given a name, placed in a proper fish bowl, and a suitable portrait was created. Unfortunately the fish met an untimely death, and by the time the paint dried on the portrait, he was forgotten. The portrait now hangs in my Etsy Gallery awaiting a new home where the face can be appreciated for generations to come by some other young fish lover. The ownership of this portrait can be yours for the sum of $50.00 plus shipping. Visit the gallery for more details or click for some closeups. This bright little 5x7 inch oil painting is finally dry. I painted in December, but the paint is very thick and has been drying in my studio ever since. Although I don't often paint flowers, this one was fun to create with heavy impasto for every petal. Here is a closeup of some of the brush strokes: It is now listed for sale in my Etsy Gallery for $50.00 plus $6.50 for shipping to US addresses. You can see more closeups of the brush stroke or purchase by clicking here. This morning when I got up, the sun was shinning and it seemed spring had arrived. Quickly I got ready for the day, planning for a refreshing morning walk, but before I could get out the door, the weather had changed and rain was falling. Disappointed in the sudden change, I started thinking about memories of spring and summer. Watermelon is an icon of summer, so I decided if the weather wouldn't cooperate, at least something of summer could join me in the studio. 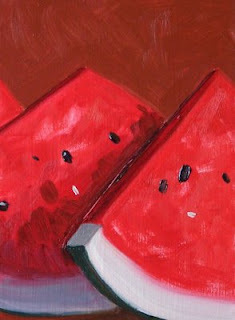 Eventually I produced this little watermelon portrait. It makes me even more excited for warm weather and sunshine. When it dries I will probably list it for sale in my Etsy Gallery or I might do a large version of it for Impressions Gallery at 1000 Markets. Until then, I'm still longing for warmth and sunshine.